So we gave it a shot, seven of them, in fact. One shot of wheat grass a day for seven days and it was not really that bad. The hardest part was developing a routine. Getting it every day was the hard part and that seems to be the thing that adds to the experience. Being healthy takes dedication and somewhat of a routine. You have to want it as the trainers say. It is not a magic potion, we have to say that right off the bat. From our research, it is part of a regimen that can lead to a lot of positives. First, increased energy. We have been working pretty hard and coffee simply does not do the trick in a lot of cases. The caffeine is notorious for petering out within a few hours. 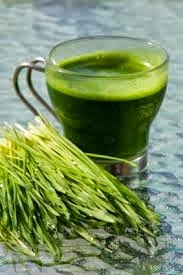 A strong caffeine start at 6 a.m. leads to a fall at about 2 p.m.
We did not find this with the wheat grass. Its effects are more long lasting and being novices to this, the three of us wondered what may have been the cause of this. Was it something that occurs across the board? Might it even have been psychosomatic? We had our launch party on Tuesday evening and a shot of wheat grass in the morning (for those of us who were willing) was a life saver after an entire evening of shots of vodka. Apparently the stuff speeds digestion and cleans out the liver, two HUGE necessities after a night out. Eli's Verdict? Every once in a while, but not every day. It is a good pick me up, but I feel I would be forced to choose between coffee and wheat grass and there is a clear winner with the coffee. Laina's Verdict? I am now a daily shot taker. I think a week is not long enough to judge the effects and I am really very interested in seeing how I feel in a month. I also want to explore more of the routine aspect of it. A shot a day...?